Another museum to which we sold 100 works of art and WOW, what they were! I can say that because most were sold in the 50’s and 60’s before I joined the firm. They include, Rubens, “The Crowning of St. Catherine,” Fragonard’s “Blind Man’s Bluff” and the Morrison Triptych. Edward Drummond Libbey (1854-1925), the founder of Libbey Glass, together with his Wife, Florence Scott Libbey (1863-1938) not only founded The Toledo Museum of Art (TMA) in 1901 but went on to fund the museum’s current palace which opened in 1912. 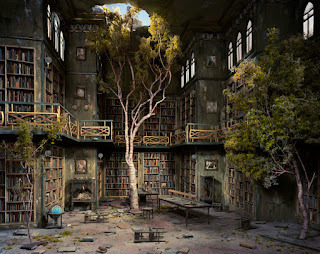 When they died, having had no surviving children, they left their entire estate to the museum. This has given the Toledo Museum of Art an ongoing endowment for the past century. I was treated most royally during my stay. On my first day I savored the collections, visited with several curators, and went on to the opening of an exhibition - more on that later. The second day, aside from more viewing, I was taken to lunch by the Curator of Paintings, Larry Nichols, who just acquired a great painting by Frans Hals for the Museum. We went to the stately Toledo Club, where the museum has a membership. I am sure that Edward Drummond Libbey would have been quite comfortable there, and he probably was. I have known the Director, Brian Kennedy, for many years. When Penelope and I went to Dublin over 20 years ago we wanted to see the French collection at the National Gallery of Ireland but were told that those galleries were closed. We made a bit of a fuss, saying that we had come for an international conference - true - and explained our bona fides. Finally this young man came down to take us around. That was Brian and we hit it off. When he became director of the National Gallery of Australia in Canberra we visited him there and he visited us in New York. He then went on to the Hood Museum, at Dartmouth and now he is director in Toledo. All the while we have remained in touch. After lunch, I had an extended meeting with Brian when he discussed the goals of the institution. He then gave me a tour of their Glass Pavilion, an award winning glass building by Kazuyo Sejima + Ryue Nishizawa / SANAA. Thanks to this building the architects won the Pritzker Prize. 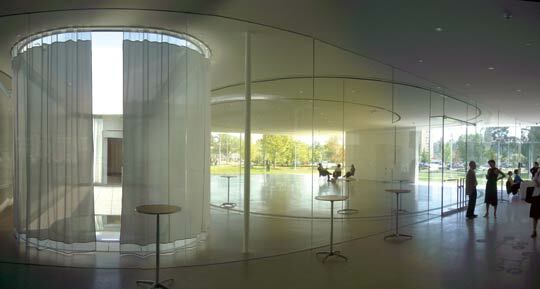 The Pavilion houses the museum’s renowned glass collection, which runs from Egypt through today. They also have glass studios which serve artists and student alike. The Studio Glass Movement with Harvey Littleton and Dominick Labino was born here in 1962. Brian also took me to see their remarkable concert hall, the Peristyle Theater. When the crash came in 1929, Mrs. Libby decided to put Toledo to work and commissioned the concert hall that seats 1,750 people. It took from 1929 to 1933 to complete the project but what a magnificent hall it is. When we looked in there was a lone pianist practicing for the concert that evening and the sound was superb. My visit happened to coincide with the opening for “Small Worlds,” where several contemporary artists showed works in different media, with the concept of life in miniature. 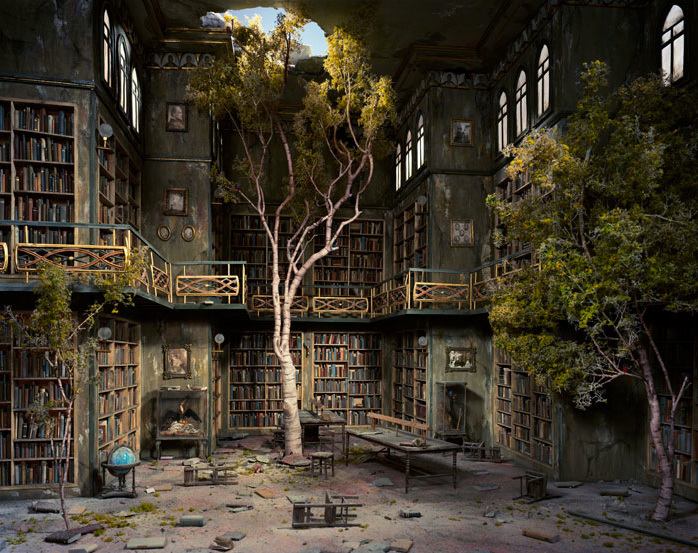 I enjoyed it far more than I expected, especially the work of Lori Nix, who built extremely detailed mock-ups and then photographed them so that you thought you were looking at an actual scene. 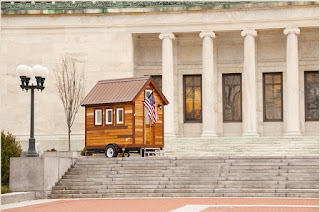 In 1997 Jay Shafer, Tumbleweed Tiny House Co. built an 89 sq. 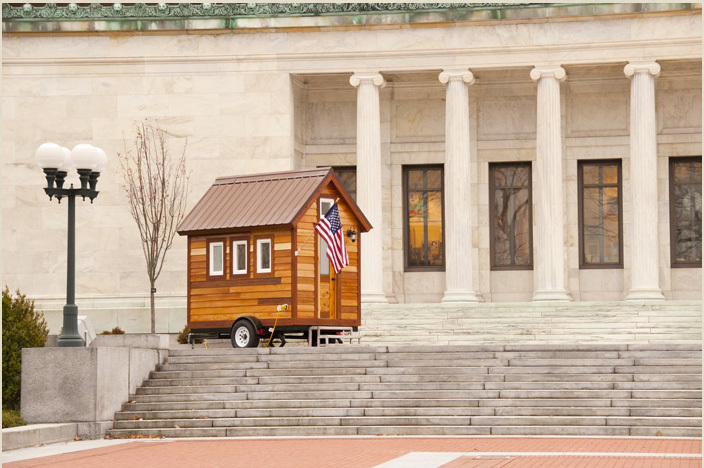 ft. house to live in; for the exhibition the Museum took his plans for an extra small 65 sq. ft. house and constructed it in front of the TMA. It has a shower, toilet, queen size bed above and a seating-kitchen area. When I was there I climbed in with Brian and the docent. For three it was tight! two would be far more comfortable. The Museum plans to auction it on Ebay on March 8, 2012. They guess that it will bring between $35 and $40,000. The opening party for the show was called “Down The Rabbit Hole”. All were encouraged to come in costume representing the characters in Alice in Wonderland. Brian came as the King of Hearts. The next evening I was invited to the dinner in honor of the artists which was a small sit down affair in the museum’s Cloister which is formed by parts of a real cloister and houses their medieval collection. Brian did a tribute to each of the 32 guests and singled me out as coming from New York to see the museum and for my family’s contribution through acquisitions the TMA was able to make through our firm. I became an instant celebrity!